The last, and the most difficult, is called Pre-market Approval (PMA). There’s a reason it’s difficult: PMA is reserved for what the FDA calls class III devices, which are medical devices or diagnostic tests that “are high risk devices that pose a significant risk of illness or injury, or devices found not substantially equivalent to Class I and II predicate through the 510(k) process”. Now it’s pretty easy to imagine that things like artificial heart valves pose of a risk of injury if they malfunction, but what about diagnostic tests? The test takes place in a lab, and can use samples (like blood) drawn using very standard and accepted methods. How is that dangerous? It’s dangerous because of what a patient might do based on the results. Imagine a test that would be used to decide whether to prescribe a drug. If the reason not all people should be given the drug is that it has serious side effects, or if it simply doesn’t work, there could be serious health consequences due to an incorrect test result. The correct outcome would be that patients who are correctly diagnosed with BRCA mutations would be given the correct drug, olaparib, and that patients correctly diagnosed without BRCA mutations would be given another drug. However, if the test produces incorrect results, the outcome would be less ideal. If a patient without BRCA mutations were given olaparib, it wouldn’t do any good, and treatment with a more appropriate drug would be delayed. If a patient with BRCA mutations was given another drug, they would risk doing worse than if they had been given olaparib. So what’s difficult about getting PMA approval? The FDA requires extensive information about the test, including the results of clinical studies of the test. This means the test must be run in real-world situations on real patients, and the test results have to be compared to other methods of determining the same results. It’s essentially like the clinical trials that are used to test new therapeutics. In the case of Myriad’s test, there are probably enough results from running this test already to provide the evidence they need. But if you are starting a new test, this might be big investment. They need to do this so they can report on what the error rates are. No test is completely accurate, so there will always be cases where a positive result is reported as negative, and vice versa. But in general, for a test to be approved, those error rates have to be known, and the rates have to be acceptable given the application of the test. For instance, if one patient in 10,000 got an incorrect diagnosis of having a BRCA mutation, that might be acceptable. But it’s less likely it would be acceptable if it was 1 in 100. 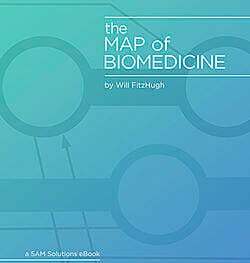 A reader commented on my last post that I was missing companion diagnostics from the Map of Biomedicine. I’m thrilled that people are paying attention and finding things I’ve missed - keep those comments coming! I’ve updated the map to add a connection between running diagnostic tests and therapeutics for clinical trials to cover this case, as highlighted in the image below. In the next Map of Biomedicine post, I’ll address research use only (RUO) tests, and begin the discussion of how whole genome sequencing is changing how diagnostic tests get developed.